I am halfway through this book and must say I am really enjoying it. Marilynn was so greatly impacted by the events of 9.11 that it literally changed her personal prayer life and perhaps even entire life. Suddenly she was concerned about the entire world not just her own little corner of it. 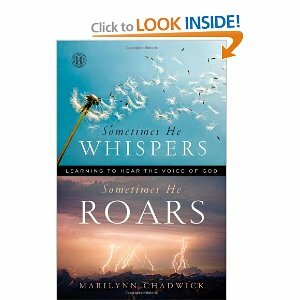 Overwhelmed, she and Holy Spirit figured it out and today she offers HER methodology – but this isn’t another formula for prayer – it is a woman’s heart sharing with others how that tragic event in our nation’s history radically transformed her approach to praying for “God’s World.” Great read. I’m glad I have a hard copy – it’s one those books you read with a highlighter in your hand! I was given the book for Christmas by two co-workers who attend the church Marilynn’s husband, David, pastors in Charlotte NC. The book sat in my “to read” bin until about a month ago when I was asked if I was enjoying it by my friend!!! This isn’t about formulas or saying the right words in prayer – it is so heartfelt and something the author lives every single day!!! I just thought I’d tell you about it! Looks like I need to add another book to my “want to read” list……….thanks!